Julie Klassen is one of those authors where you just buy her book off of name recognition. I saw this for 1.99 and needed something to read, so I bought it. And it started out intriguing, and different than other regency novels. The protagonist, Hannah, is a lady's companion to an unfaithful, and silly woman, but left for unknown reasons. She comes back, needing money and reluctantly agrees to join her employers at a new house. 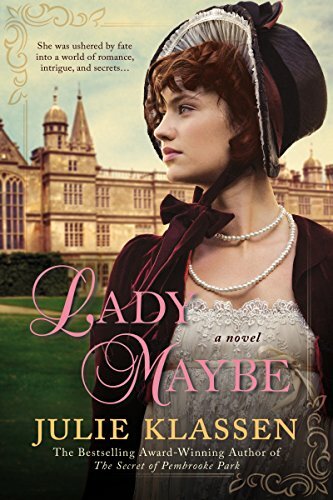 After a horrible carriage accident, there is a case of mistaken identity and she realizes she must keep up the farce to go rescue her baby who was left behind, being held by an unscrupulous caretaker until she can pay up. At this point, things start getting ridiculous. I liked the unfolding mystery and the series of detailed memories that reveal different things, but the love triangle served no other purpose except to add unnecessary sexual tension. Both guys had a Mr. Rochester/Jane Eyre feel to them, which the author admitted was part of her inspiration for certain scenes. For me, it just made both guys unlikable. I kept thinking, is this really a Julie Klassen novel? It had Christian themes of forgiveness, grace, and truth, but the protagonist didn't match the ideals she claimed to want to live up to. I saw little growth in her character. She was not careful about her reputation or her amorous feelings, or how she allowed men to treat her, even after having just experienced the effects of having a child out of wedlock. The setting was carefully researched and it was free from grammatical errors, but I did not really enjoy this and almost gave up on it about halfway through.